A student strike against the neoliberal education policies of conservative Governor Luis Fortuño Burset of the right-wing, pro-statehood New Progressive Party has led to the invasion of the University of Puerto Rico’s campus in Rio Piedras, just outside San Juan, by police. But the students are not giving up. The central issue in the strike is the role of the university as an educational center available to the whole population (about 3.76 million) of Puerto Rico regardless of economic status. Early in 2010, the island’s government announced that it was going to add an extra “Fiscal Stabilization Fee” of $800 for each student per semester, starting in January 2011. The reason given for this action was the bad state of the Puerto Rican economy, which has been hard hit by the world financial and economic crisis. However, student activists and their supporters in labor and the general community are not buying this, and accuse Fortuño’s government of aiming at a corrupt privatization of university functions. Student leaders say that the new fees would push as many as 10,000 students out of 65,000 in the 11-campus University of Puerto Rico system. The Puerto Rican government, pleading budget shortfalls, has failed to honor commitments to fund the university facilities, provoking the crisis and endangering the accreditation of some of the campuses. Students at the main campus of Puerto Rico at Rio Piedras, just outside the capital of San Juan, began protests against these policies in the Spring, when they shut down the campus for two months amid clashes with police. On December 14, students again went on strike at Rio Piedras and five other campuses (out of the total of 11), with demonstrations, rallies and marches involving at least 500 people. On December 20, police units, including the SWAT team and private rent-a-cops contracted by the University, were sent onto the campus to suppress student protests. 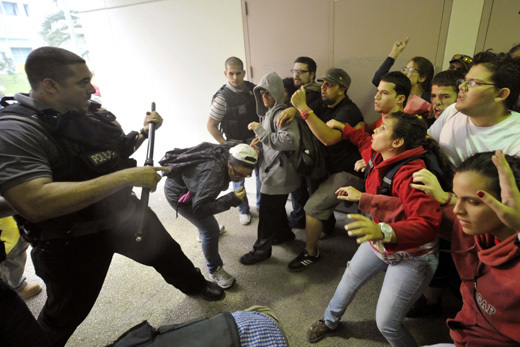 This violated a major tradition in all of Latin America which is that university campuses are autonomous and are not to be entered by police or troops. Before the police invasion, the Puerto Rican Supreme Court had issued a ruling that student strikes can be prohibited. Police used tear gas, beat students and arrested 18, some accused by the police of using smoke bombs to roust non-striking students from the Natural Sciences Faculty. In response to the police action, a protest of 15,000 people marched on the governor’s mansion, La Fortaleza (the Fortress) in San Juan. Governor Fortuño blamed the disturbances on “leftists”, and the Chancellor of the Rio Piedras campus, Ana Guadalupe Quiñones, expelled one of the main student leaders, Giovanni Roberto, and prohibited him from coming on campus. Authorities are insinuating that the people who are striking and protesting are not real students at all, but individuals with left-wing political agendas who hang around campus to agitate. Even though the strike does not have 100 percent support from students, it is supported by unions representing both teaching and non-teaching personnel, as well as UTIER, the Puerto Rican electrical workers’ union, and other organizations. As the re-commencement of classes January 11 approached, student organizations were meeting with university president Jose Ramon de la Torre to press demands to cancel the $800 fee and find other ways to finance the university, but so far to no avail. On Friday January 7, student representatives met with Puerto Rican Secretary of State Kenneth McClintock to press their demands. Omar Ramirez, president of the Council of Students on the Rio Piedras campus, reported that insufficient progress had been made to call together a student assembly to consider government proposals. The administration of Governor Fortuño has a well-deserved reputation for union-busting and anti-worker policies, having pushed through legislation that has cancelled all public worker labor contracts. 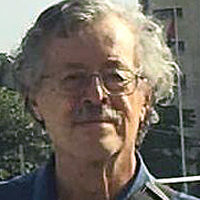 Thus many people in Puerto Rico and beyond are looking at the student strike, which is similar to others that have been happening as far away as France, Italy and the United Kingdom, as having a wider societal importance, as a line in the sand against neoliberal “solutions” to the world financial and economic crisis. . Accordingly, the Organization in Solidarity with the Peoples of Africa, Asia and Latin America (OSPAAAL) issued a statement of support for the students, which says in part “we make manifest our unbreakable solidarity with [the students’] struggles and demands, by which they are defending a future of dignity, a different and inclusive society for all, a country that breaks the chains of oppression and looting based on the principles of privatizing neoliberal policies”. Miguel Cruz and Luis Mojica of the Communist Party of Puerto Rico put the decision starkly: “Education is not a commodity and the University won’t be destroyed”. To read more see here and here. In Spanish see these: Puerto Rico, Student Protest.